RUSH: Here’s a piece from GQ, Gentleman’s Quarterly. 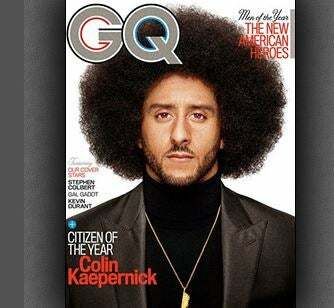 They just put Colin Kaepernick on their cover as Citizen of the Year, a guy who’s never voted has become Citizen of the Year at GQ, a supposed men’s fashion magazine. In fact, the way to lead into this is to share with you a tweet from Chuck You Schumer. We were talking about this earlier this week. In years past on Thanksgiving, Obama and the Democrats have always urged you to talk politics at Thanksgiving dinner. Obama ran ads. Remember the Pajama Boy series of ads was actually an Obama administration production designed to get you to start selling Obamacare over the Thanksgiving holiday to your friends and family gathered for Thanksgiving dinner. Obama urged this. This year a bunch of leftists have come forth and said, “You know what, let’s not talk politics this year,” because they’re losing, folks. They’re in trouble. There’s not a whole lot going on politically they want you to talk about. They’ve got some things. They think they’re gonna run the table with Roy Moore and all of this. But there’s a huge level of discontent on the left. But it’s not universal. And he’s got a chart here from the Joint Committee on Taxation, which is a bunch of caca, showing that the Republican tax bill, House and Senate version, only cut taxes for the wealthiest Americans. It’s nowhere near the case. The wealthiest Americans are not gonna get a tax cut. Well, they’re not gonna get a rate reduction. In fact, they’re going to pay a special rate of 46% in order to make sure they don’t get a tax rate reduction. But, anyway, it’s how the leftists ruin Thanksgiving, how they seek to ruin Thanksgiving. Here’s Chuck Schumer printing out a chart in a tweet, you’re supposed to print it out, take it with you to Thanksgiving dinner and provoke an argument among any Republicans at your Thanksgiving dinner and then throw this chart in their face to show them how wrong they are and how the Republican tax reform bill is only again benefit the rich. And then the GQ story, headline: “It’s Your Civic Duty to Ruin Thanksgiving by Bringing Up Trump — This Turkey Day, Consider Making Life HELL for a Few of Your Relatives. It’s late-November 2017, and you know what that means: Every man you’ve ever seen on TV for any reason has just been unmasked as a woman-hating sewer ghoul. Also, it’s time to ruin your Trump-supporting family’s Thanksgiving — for America! It goes on and on to talk about what happens at Thanksgiving dinner. And then offers a few suggestions for how to ruin Thanksgiving. “Don’t show up. For some parents, your absence will speak louder than any sodden arguments over the density of pumpkin pie.” Anyway, I could go through the details, but the point is made. 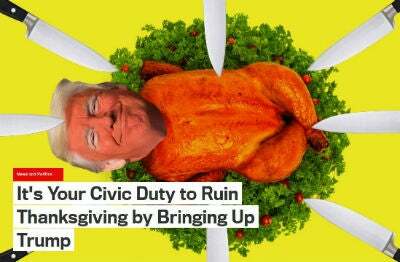 You have a civic duty to ruin Thanksgiving by bringing up Donald Trump and whatever else. RUSH: I’m not gonna bother showing you the chart from Chuck Schumer on the Dittocam. Not gonna take the time and go through the trouble. I just want you to understand that it is a total lie. The way Chuck Schumer and the Democrats try to make their point with a chart that tax cuts are only going to benefit the rich, that there are no tax cuts for the middle class, the point of it is that the tax cuts are gonna sunset in 10 years. The Republicans did that in order to make the budget budget neutral. It’s a time-honored gimmick, and it’s because of the way these things are scored by the various budget offices and so forth. They score these things in a static fashion, and so some of the tax cuts will sunset in 10 years, and because of that Schumer’s saying, “Nothing here for the middle class.” It’s a convoluted argument. The thing that you just have to realize is that no matter what is in a tax cut offered by the Republicans, the Democrats are gonna demagogue it and say it’s nothing but a tax cut for the rich and not for anybody else. But the chart that he’s published here — just trust me on this — is a total lie. The thing about socialism and capitalism — very easy to remember this, folks. We’ve observed this on many previous occasions. In capitalism, rich people become powerful. In capitalism, middle-class people could become rich. In capitalism, middle-class people could become rich and then become powerful. In socialism, the powerful become rich. In socialism, the great middle class has no chance to become powerful or rich, by design. And that leaves only one place for people to go to acquire power and to acquire money, and that is the government and, more importantly, running it, having control over it. And human nature being what it is, it is why socialism always ends up being a tyranny.